PM123 1.4x is a fork of PM123 1.32 providing many new features. See change log for further details. The source code is now hosted at GitHub including the history since 2006. See http://glass.ptv.ru/pm123.html for the 1.3x releases. PM123 1.41 should be rather stable. It is probably the last release from me. However, I will still fix bugs if I get detailed bug reports. If you want to contribute to the further development have a look at the developer documentation to get used to the source code or contact me. See the task list for open issues. Note that the debug build is slower, but it provides support for detailed error tracking and bug reports. Furthermore the logging can cause drop outs in the audio at heavy system load because of the reduced priority of the logging output during DART events. Unzip the binary zip file to a new folder. You may use configuration files from older PM123 1.3x releases. Most of your settings will survive - sometimes too much. But it is strongly recommended to force the default settings for all plug-in types in the properties dialog. There are restrictions when using older plug-ins. Playlists may now be nested, even recursive. More than one playlist window can be open at the same time. Playlist Manager, playlists and bookmarks are basically the same. 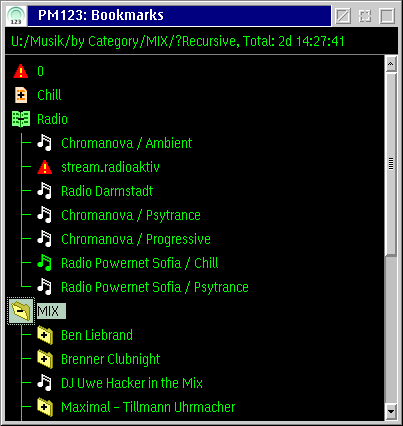 Nested playlists create sub menus in the bookmarks menu. The playback controller now prefetches songs of playlists and keeps the output device open. This allows gapless playback of items in playlists. Furthermore you can navigate within the playlist with the slider using the Alt key. The plug-in interface has been significantly improved. This interface allows more flexibility to buffer handling and filter plug-ins. This is required for plug-ins like digital room correction. The new plug-in manager checks whether the PM123/plug-in pair is likely to work. It can load most old plug-ins except for visual plug-ins through a virtualization layer. The visual plug-in compatibility is broken since PM123 1.32 anyway. FLAC and CUE sheets are now supported natively. Folders can be played directly reflecting changes to the file system. PM123 can directly stream to PulseAudio servers. This is particularly useful when running OS/2 inside virtual machines to avoid all the drawbacks of virtual sound devices, first of all the latency. Recording from PulseAudio source is also supported. See change log for further details. an exact description how to reproduce the problem with a newly started PM123. Please keep the playing time as short as possible, when creating a log for a bug report, because the log file grows rapidly. If you manage to reproduce the problem with a hopefully small log please compress it and attach it to the bug report. Mails with some megs of attachments may not reach their recipient. Filter plug-in interface: improved potentials The old filter plug-in interface offers very few options. Each block has to be processed synchronously. This may cause unwanted latency as well as bad performance. Add custom entries to the context menu "Load...". The decoder plug-in interface provides now a function to extend the Load.../Add... context menu. Split decoder plug-ins into connection and decoder plug-ins. This enables different codecs to be used for streaming sources. Better performance with many decoder plug-ins Currently each decoder opens the target to check whether it can play it. This could cause heavy load if there is no file system cache, like with http streams. Flexible extension of GUI by plug-ins Currently each plug-in has it's own configuration dialog. From the users point of view it is not obvious where to seek for a setting. FFT-Convolution, improved filter kernel design The FFT convolution is many times faster than any hand-optimized MMX code. So using FFT convolution is the prerequisite to use larger, more accurate filter kernels. The original kernel design function created FIR kernels with very bad locality and unreasonable sharp transitions at high frequencies. Furthermore low frequencies are processed very poorly even at the maximum FIR order. digital room correction A plug-in that accepts a custom FIR filter kernel to do a digital room correction. Since this requires quite large filter kernels, there is a strict dependency to the improved filter plug-in interface above. Otherwise a latency in the order of one second is introduced and the same amount is cut at the end of each file. requires PM123 1.40 Many sound cards and/or drivers have linear volume controls for the mixer channels. Only the master volume is logarithmic on the better ones. This is not very helpful with respect to our acouesthesia. New Ogg Vorbis plug-in The new plug-in is superior to the old one in any way. Compressor plug-in Some sources like radio streams do not support ReplayGain values. They are often extremely loud. This plug-in compensate for that. Flac plug-in with support for embedded CUE sheets Using the new playlist plug-in interface of PM123 1.41 and object slicing embedded CUE sheets are no longer a no-go. The most popular one, flac should be supported. Download the PM123 1.4x files to get the plug-in. RealEQ 1.22 is included. This file is included since PM123 version 1.40 and should already be in-place. RealEQ does no longer delay the playback and cut the last samples. It operates now as zero-phase filter using read-ahead. This gives a very fast response to user actions like seek. Enabling/disabling the EQ does no longer cause the playback to jump. The maximum FIR order is now 16384, giving very accurate results. The maximum FFT size is now 32768. This causes reasonable low CPU usage even with large FIR orders. The MMX and standard convolution has been finally removed. Both are outperformed by the new FFT convolution. The output of the equalizer is now stereo even if the input is mono. This is because the filtering in general gives different results for the two channels. The equalizer can equalize the group delay. This is a very powerful feature if you know how to use it. It can compensate for group delays of crossovers, vented enclosures or room resonances. Comparison of the different RealEQ versions. 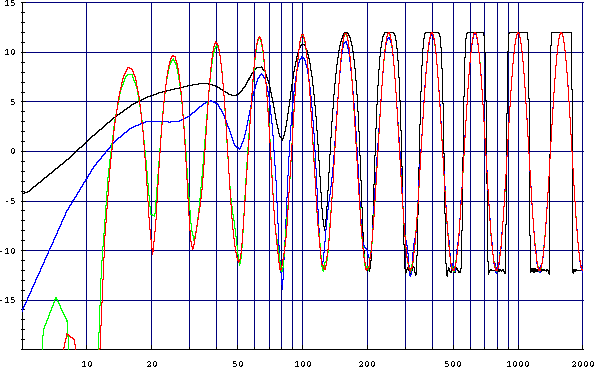 Frequency response of the equalizer at 44,1kHz sampling rate when all sliders are set alternating to +12dB and -12dB. Even at the same filter order of 4096 the new equalizer performs better by nearly a factor of two. Deprecated! Included in OS2AUDIO.DLL since PM123 1.41. Download the PM123 1.40 files to get the plug-in. LogVolum is included. This file is included in PM123 version 1.40 and should already be in-place. This small plug-in turns the characteristic of the volume control in PM123 from linear to logarithmic. You may use this plug-in to compensate for the linear characteristic of the volume controls of the many common sound devices. Do not use this plug-in if your sound card already has a mixer with a logarithmic characteristic. Response of the PM123 volume control. The red line is the response function with the correction. The green line is the response function of usual sound devices without this plug-in. with x and y in the range [0,1] for the transformation. This gives an approximately exponential function with a usable dynamic range of almost 30dB while keeping the zero point at -∞dB. Download the PM123 1.4x files to get the plug-in. OS2rec is included. This file is included since PM123 version 1.40 and should already be there. sounddevice is either a device ID (integer number) or a name of a mixer device usually AMPMIXxx. The Device ID 0 is the default MMOS2 sound device. The parameters below may be used to control the recording parameters. share[d] y[es]|n[o], default: yes yes Using the non-shared mode will also block other mixers from working. record:///0?input=mic Start recording from the default microphone input. The plug-in should introduce a defined latency before passing the buffers to the output. Since the playback is normally absolutely synchronous you may never get the buffers filled. So drops in the sound are very likely to happen. When the recording and the playback is not done on same physical sound device it may get out of sync with time because the two sound devices do not use exactly the same sampling rate. This will cause dropouts or jumps whichever is the faster device. Most likely this will never get fixed. Replace REALEQ.DLL in your PM123 directory by the one above. PM123 must not run meanwhile. The new plug-in give you an additional choice how to do the convolution: FFT convolution. I strongly recommend to use the new FFT convolution, since it is far superior. Furthermore it does not depend on CPU features like MMX. It scales with O(log n) with the FIR kernel length whereas the other methods scale O(n). Now the maximum FIR kernel length is 12288. I recommend to use this maximum together with the maximum FFT plan size of 16384 unless your CPU sets you a more restrictive limit. Otherwise the first three sliders at 16, 20 and 25Hz will not perform very well. But do not try to use these values without FFT convolution. You may reduce the FIR kernel length if (and only if) the low frequency sliders are set to the same value or at least very close together. For each consecutive slider which has the same value than the 16Hz one you may shorten the FIR kernel length by about 26%. The FFT plan size in the settings dialog has now no more meaning unless you choose FFT convolution. The plan size for the FIR kernel design is now chosen automatically. The desired frequency response function is now interpolated between the supporting points with a sine² function. This avoids unreasonable sharp jumps in the frequency response and makes the filter kernel shorter. The filter designer does no longer create 32 base functions in the time domain which are mixed when an equalizer slider changes. Instead, the FIR kernel is always created from scratch. This reduces the memory footprint by 1,6MB. Instead of that a DCT transformation is required now on each parameter change. However, this is required anyway to support the FFT convolution. The windowing function is much more aggressive now. The results in a worse stop band attenuation. However, since the equalizer does not provide more than 24dB dynamics anyway this is reasonable. Additionally the sine² interpolation above acts like a window function too. 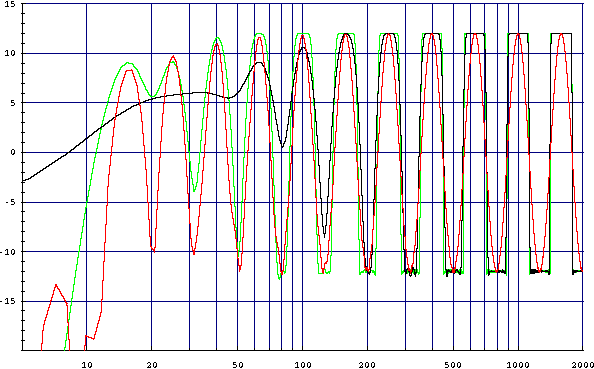 Frequency response of the equalizer with an FIR length of 12288 at 44,1kHz sampling rate when all sliders are set alternating to +12dB and -12dB. The black line is the intended frequency response. 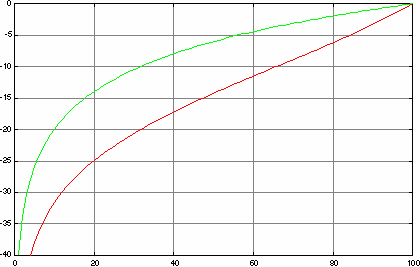 The red line is the achieved frequency response. The green dots are the (first) supporting points used for the filter design. Comparison of the new implementation. Black line: real frequency response of the old implementation with the maximum FIR order of 4096. Nothing reasonable happens below 100Hz! Red line: real frequency response of the new implementation with the maximum FIR order of 12288. 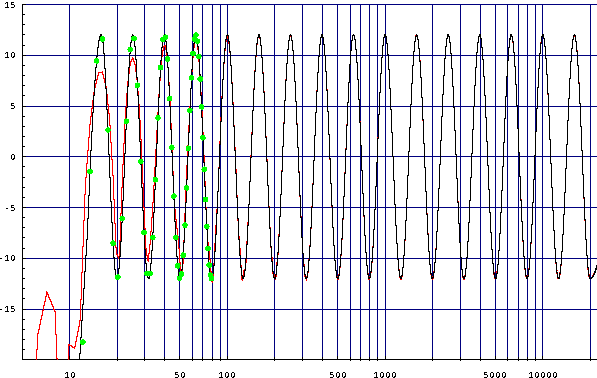 Green line: extrapolated frequency response of the old implementation with an FIR order of 12288. This is only to compare the filter design, since the old convolution core was too slow for this filter order. Discontinued. Newer version included since PM123 1.40. Replace ANALYZER.DLL in the sub folder visplug of your PM123 directory by the one above. PM123 must not run meanwhile. a logarithmic spectroscope, scrolling right to left. The spectroscope shows the amplitude as the color, the frequency as screen location and the time as screen location in the other direction. The dynamic range of the spectroscope is 40dB. Due to the usual nature of the frequency distribution in common music an additional weight function which scales with the square root of the frequency is multiplied to the amplitude before visualization. This version of the analyzer also offers a new option called "high precision mode". This will take twice as much samples for analysis. Of course, the CPU load will increase. However, I recommend this at least for the logarithmic spectroscope to get more reasonable results.